Hamble Le Rice got its name from the rise of land, above the River Hamble, where the settlement sits. Although it can sometimes take a while to wind down the lanes to the Hampshire shore, it is always worth it. Some of Hampshire’s earliest settlements existed on the banks of Hampshire’s rivers as they sweep out into Southampton water. The River Hamble is one of three rivers that spill out between Portsmouth and Southampton, the other two being the Meon and the Itchen. 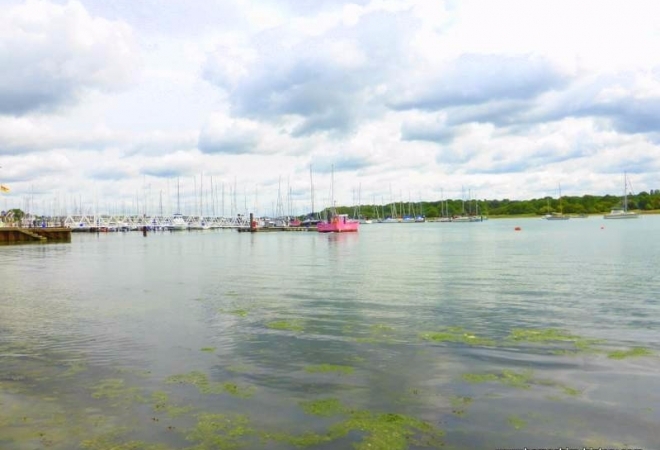 The Hamble though, has a large estuary, surprising for a river that runs a short course. It rises north of Botley and south of Bishop’s Waltham, gathering pace as it passes the Curbridge Estate and then the boatyards and marina of Bursledon before the estuary opens out into Southampton Water at Hamble Le Rice. For hundreds of years there has been a ferry between Warsash and Hamble. Many were occupied by the waters of the Hamble as this coastguard cottage shows. In the 18th and 19th century, Hamble bristled with drinking houses. At the quayside in Hamble. The wide open estuary and skies of the River Hamble. Evidence of rope makers in historic Hamble. The church of St Andrew the Apostle Hamble. Historically, the Hamble estuary embraced all comers, from the invading Saxons and Jutes to the Danes, who wound their boats deep into the landscape via its course. It is a small river carrying a heavy historical load. The rise of land, on the western bank of the river was the perfect position for a settlement. It was also a perfect landing place for early Christian missionaries, as they crossed from Europe. Within the Priory church of St Andrew the Apostle, traces of Roman tile and Saxon stonework still exist. It was from the River Hamble that St Willibald, related to Nursling’s St Boniface, left these shores for Europe. He was born about 700 AD and studied in a monastery in Waltham. This part of Hampshire attracted its fair share of early Christian missionaries and some of the earliest churches in the country were built along these shores. The rivers provided a safe and easy means of transport to penetrate further inland and save the Jutish tribes from their heathen ways. It was not the only river to be thus used, St Wilfrid for example established the church at Titchfield and used the River Meon to take the Christian message further afield. By the 12th century, Bishop Giffard of Winchester had established a cell of Benedictine monks at Hamble Le Rice. The monks came from the Abbey of Tiron in France. Another of their cells was established at West Worldham. A link between Winchester and its Benedictine Priory of St Swithun and the monks at Hamble Le Rice was soon established. At Lent the monks at Hamble provided 20,000 oysters to the Priory at Winchester. In return they were clothed and provided with 21 loaves of bread and forty three flagons of ale a week. The oysters were gathered from the substantial oyster beds that flourished for hundreds of years out in the Hamble estuary. Presumably the oysters weren’t all delivered in one go, as that’s an awful lot of oyster to eat at one sitting! Early on, defences were built on the southern peninsula of Hamble, on an area known as Hamble Common. The earliest period of activity is Iron Age a linear earthwork suggests an association with an Iron Age promontory fort. There is also a Medieval enclosure and a site known as St Andrew’s Castle, a 16th century structure and one of the Solent forts, another being Netley Castle, are on the shore approximately between the high and low water marks. It was a mariners haven as early as the 13th century, with boats unloading catches from near and far. Boat building was also already well established by the 14th century when the Hamble supplied 7 ships and 117 mariners for the Battle of Crecy. IN 1377 French raids on the southern shores saw the defences at Hamble as being an easy target and took little time in rendering them useless. When King Henry V decided to take on the French he chose the Hamble boatyard of William Soper to undertake a considerable part of the construction of what was to be his greatest ship, the ‘Grace Dieu’. She still lies in the fine mud of the river. The Hamble estuary lent itself to being a fishing port and the tiny seaport once was alive with the fishermen and families who made their trade from landing all manner of fish, lobsters, scallops from far and wide. The sea was never far from the doorsteps of the people of the Hamble and their occupations stretch far back, hundreds of years into the past. The 1851 census is filled with mariners, widows of mariners, fishermen, fishmongers, fish merchants, watermen, shipwrights, ship owners, oyster merchants, licensed pilots, dock labourers, blacksmiths and carpenters. Some Greenwich ‘out’ pensioners were also living in Hamble. Another interesting occupation was, ‘watchman at lobster pond’, what exactly was his role? Fishermen would leave a mark on the door of the church and then when they had safely returned, strike it through to make a cross. The Hamble once rivalled Portsmouth as a naval dockyard. We mentioned earlier the King Henry V and the Grace Dieu. In the reign of King William III, two large warships were built here. Numerous boat building yards plied their trade on the banks of the river, pushing their slipways out into the waters of the river. King George II also commissioned a number of warships to be built of the yards. The area is a favourite still amongst mariners and the whole scene at the Hamble Le Rice quayside is filled with boats of all shapes and sizes. Boat yards and repair shops can still be found up and down the Hamble Estuary. Hamble might be famous for its boat building but it is also the setting for some extraordinary aircraft engineering history. In 1912 a prototype seaplane was engineered at Hamble Point. In 1915, Fairey Aviation established a factory for the manufacture of seaplanes. The A.V Roe factory was established in 1916 and in 1929 was sold to Armstrong Whitworth Aircraft, who established the Air Service Training (AST) to provide aviation training for both civil and military pilots The airfield at Hamble Le Rice became the home of an aircraft training centre during World War II for planes including the greats, the Spitfire, Lancaster and Wellington. Amy Johnson, famous for her solo flight from England to Australia, joined a flying course at the Hamble airfield in 1932 but she was preceded by another woman, Mildrid Bruce, who was the first woman to complete a solo circumnavigation of the world but of whom we here less about. In 1936 British Marine Aircraft opened a factory at Hamble south. The airfields were kept busy during WWII, so many activities taking place, including the repair and overhaul of Spitfires. There is an abundance of history packed into this small settlement. It has an excellent local history group from whom much greater detail can be found about the aviation history of Hamble. And we haven’t even mentioned the training ship, TS Mercury nor investigated the ancient church of St Andrew the Apostle nor made up way up river to Bursledon, its history and windmill. There are a myriad of reasons to take an historic trip to Hamble Le Rice.